There are few acceptable words that I can use to describe my disbelief in the election results. If any of you were filming me the night of the election, you would have had to use the five-second delay button to bleep out the many expletives pouring from my mouth. But that was two nights ago. Today is Thursday, November 10, the day after the 2016 Election. I have decided to use my “acceptable” words to describe how we move on from here. First, to the media makers: Now is the time to unpack what happened to the Black electorate. We need real and honest discussions about what it means to be a Black American and an American. Last night’s win makes it quite evident that none of us are experiencing the same America — and we should know why. So, media makers, go out there and bring the hard questions to Black Americans: document the campaign of “Make America Great Again” and encourage people to tell their stories. We’ll need them by 2020, in order to understand what’s at stake individually and collectively for Black Americans, and for all Americans. Second, to the media viewers: Did any of you see this image? I did, and was horrified. As an African American, this slogan conjures an image that is all too real. Trump did not create the public’s distrust of news media. That began long ago with the corporatization of our news outlets, and the dismissal of the well-reported news story for a simply crafted soundbyte. What Trump has done is ignite public rancor for a media that talks at them, not to them. But should such malice lead to such hate? Should we ride along with a president who doesn’t value transparency? I think not. 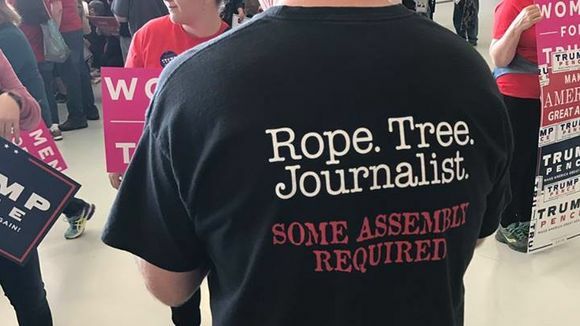 Instead, we must fight harder for our constitutional right to a free press. We must demand that our media institutions keep us fully informed of the issues and policies that impact our daily lives, using facts and figures, not hearsay and gossip. It’s the best way to keep our congressional representatives — and, yes, even the president-elect — in line and in check. Finally, to both our media makers and our viewers: We can no longer afford to take our public institutions for granted, and that includes public media. The President-Elect and the right-wing conservatives may not be aiming for PBS, NPR, CPB or the stations right now (they have too many other things on their agenda, like trying to build that stupid wall). But previous experience suggests they will be looking to place public media in the crosshairs eventually. If public media is defunded and dismantled, we will have lost the one commercial free media channel that doesn’t require you to have internet, wifi, satellite or cable. We will have lost an educational resource that doesn’t require a paid subscription to access. We will have lost the best opportunity we had to give voice to the diversity of the American perspective. So if you have the means to become a member of PBS or NPR, then do so. Make a point of tuning to your local channel every day, scrolling through the videos online or on the app. If you don’t see or hear anything that represents your perspective, then call, email or tweet your station and let them know you want hear or see more diverse programming. The squeaky wheel gets the oil, right? Take your produced programs to the station. They may not have the capacity to acquire it, nor program it, but let them know you are a local producer who has something to offer. And finally, when you call your congressman or senator to ask them not to repeal the Affordable Healthcare Act or demolish Social Security; or to demand they not spend your hard-earned tax dollar on building that useless wall, throw in that you are also a public media viewer and that you DO NOT want to see it disappear. Because, make no mistake, if we the public don’t stand up to protect public media now, it may be gone forever. Next Story12 Black holiday Films for the Season!